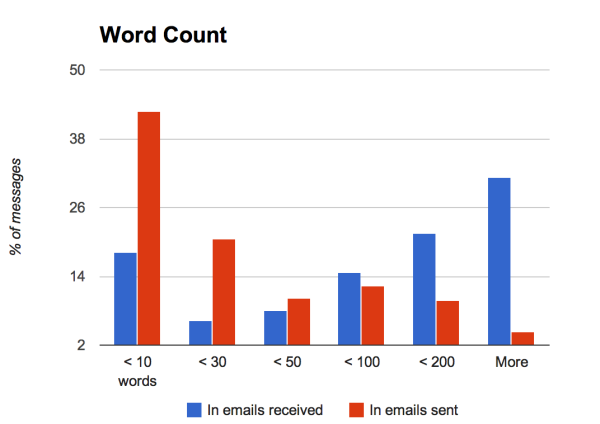 I've been conducting a little case study over the past several months on email length and response times, and I'm excited to share the results. I used Gmail Meter to analyze my email, and I found a surprising correlation between super-short emails and fast response times. How short is short? Really short -- like under 30 words. Here's a graph of my emails by word count. Note the red bars, which reflect my emails sent. Most of them are under 10 words. Now take a look at the time that elapses before I get a response to those emails: almost always under an hour, and usually within 5 minutes. There's another correlation I want to point out. Look at these charts again, but now examine the other end of the spectrum -- the longer emails. Note how many emails I receive that are over 100 words (the last two blue bars on the right). Think this affects my own response time? You bet it does. Check out the cold, hard data. Even a ridiculously efficient person like me puts these emails off for anytime between an hour to a day. Many entrepreneurs are familiar with David Allen's Getting Things Done methodology, and the 2-minute rule. Craft your emails so that processing them would take under 2 minutes. You'll be amazed at how quickly you get responses, and how much time you cut out from your email routine.